Gemini 2014 horoscope predicts that this will be an auspicious year in terms of money, finance and career for those under this zodiac sign. You will go through life at rocket speed. Sticking to your task will benefit you at work this year. Do not be in a hurry to get into and out of relationships. 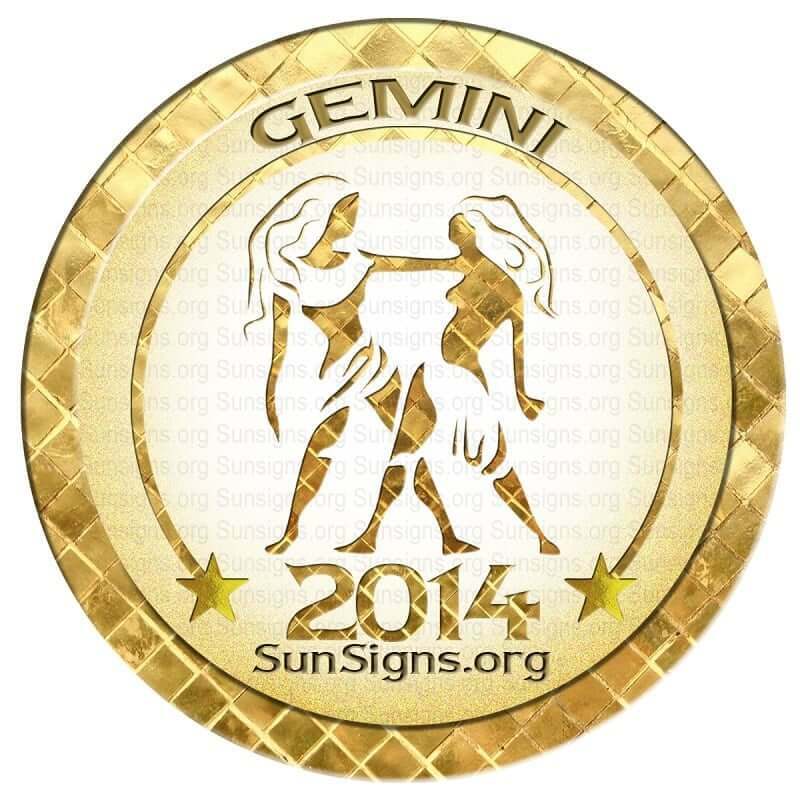 Impatience might be the reason that relationships might break for the Gemini in 2014. The work forecast for 2014, indicates that you may acquire additional skills. You might find things to exercise your curious streak and expand your horizons. Some aspect of your curiosity may draw publicity. This is the time to make a presentation or make known an innovation. While Jupiter is retrograde during December you will not be as influential. There will be delays and glitches. You will write to one person and another person will get the information. Also there is the possibility of misunderstandings in regard to documents predicts your 2014 career horoscope. Saturn is in the house of work through the latter part of December. Your actions will not be rewarded before this time. Your relationship with your employer will be difficult. This is the influence of Saturn. Exceptional work will be seen as ordinary. If you wish an increase in pay prove you deserve it. Your boss’s energy will go into berating you for your work. The mood among your colleagues is less than ideal. Those Gemini working in your own businesses will need good fortune to cope with all the people required to maintain your business. It is Saturn that is introducing these less than positive elements. During the period from March to July your productivity is poor at work. This can be attributed to retrograde Saturn. Strict adherence to regulations and every man for himself attitude will put you down. This will be present whether you stay put or move companies. Your best defense is to do the best job you can. Money matters have been improving beginning in the mid-part of 2013. Gemini zodiac sign people may thank Jupiter in your house of income for this change. The source of income could have been either work or personal life related but the gains have been real. Gemini, your financial astrology predicts that Jupiter will be assisting you until July 2014. Keep hold of this money, and discover how to increase your wealth safely. July 24 is a day for financial activities. Everything will combine so that you create a single financial gain. A conjunction between the sun and Jupiter is responsible. Alternate days that may have a special effect in regard to money are June 18 and May 6. The influence of Saturn is affecting your health. Anything you have disregarded may recur. Do visit your physician. Maintain the correct diet and exercise program. Do check with your dentist and do a check for osteoporosis. Where treatment is necessary it will feel like it takes forever. If a special food regime is required you may find it very unpleasant.Accept these health predictions as a guide and keep well in 2014. Saturn and Jupiter will both have strong effects based on their placement in the natal chart, Gemini. Your horoscope indicates both positive and negative events this year. You should move forward in all aspects of your life. Move ahead with all your vigor! January will be a very hardworking month for you. Family will take a back seat. You will be revaluating your aims and goals in February. March is a good month for work related travel. Love and finances will not be too strong. You have to push ahead in April irrespective of what people say. Family will be supportive. May is a good month for love, family and relationships. You can expect a lot of passion in June 2014. Finances will be excellent. July will see major financial and personal developments taking place in your life. August will be a hectic month for you. You will need to find a proper balance. September is a time for rejuvenation and reconstruction of everything around you. October will be a month of overindulgence for the Gemini. November will be a socially busy month. Career will improve towards the month end. December will be a happy month. Finances will be stable. Love will blossom.